The hubster and I don't have any children (yet). The yet is completely inconsequential to both my parents and in-laws who basically think we are giant losers because we have not given them any grandbabies. A few days ago, my mom said, "I'm always so embarrased when I go out to lunch with friends and I have to tell them that I don't have any grandchildren." Yup mom, your daughter and son-in-law, both of whom have advanced degrees, are self-sufficient, responsible individuals (who recycle and have no overdue library books!) have completely failed you :). The point being, when you don't have any children and neither do any of your siblings, you can love on your friends' babies. It's the best kind of love. You hug and squish these adorable babies while they happily drool and giggle and as soon as they begin to cry, you pass them off to the nearest biological parent. That is exactly what I planned to do this past weekend, as my darling friend's even more darling son turned one. 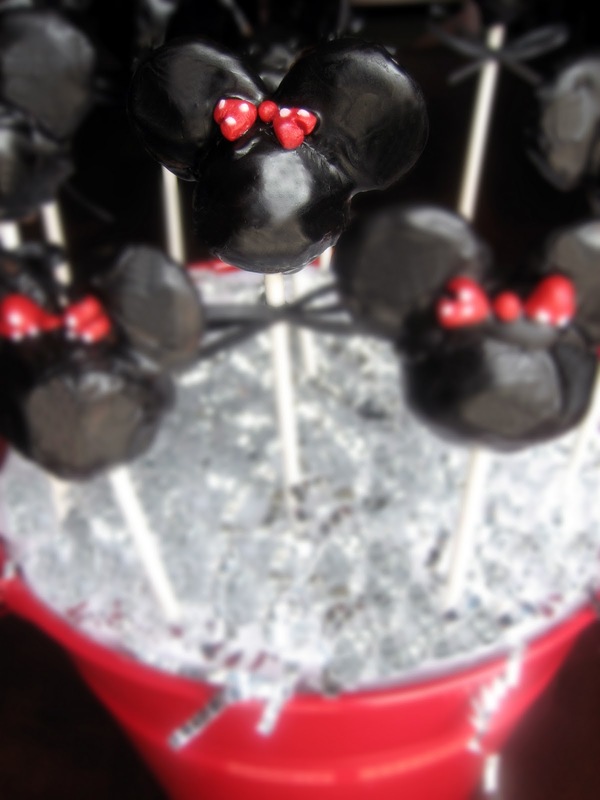 It seemed only fitting that I make Bakerella's famous Mickey Mouse pops for the, you guessed it, Mickey Mouse themed birthday. I opted to make the silhouette versions because I think they look more sophisticated than the ones with faces painted on. Ok, I'm lying. I opted to make the silhouette versions because it was possible to make them in the three hours before the party whereas it would've taken me days to paint faces on the darn pops. Even without faces, the pops took a long time. And the pre-pops? They took even longer. See, my neurotic self had to figure out some way to display the completed pops. A box wouldn't do. Neither would a bowl. And so, I dragged the hubster to numerous art and party supply stores until we discovered these babies. Perfect. I'm sure they were intended to display a bunch of proudly waving flags, it being close to the fourth of July n' all. They also made perfect vessels for my pops. Yay for patriotism! So, I got the majority of supplies the weekend before the party. I was going to make the pops the morning of. Things were perfectly in place. Or so I thought until Wednesday night when I went to my local grocery store to pick up a bag of candy hearts for Minnie Mouse's hair bow. Simple right? Not so much because candy hearts are only sold in a precise 2.5 week window before Valentine's Day. 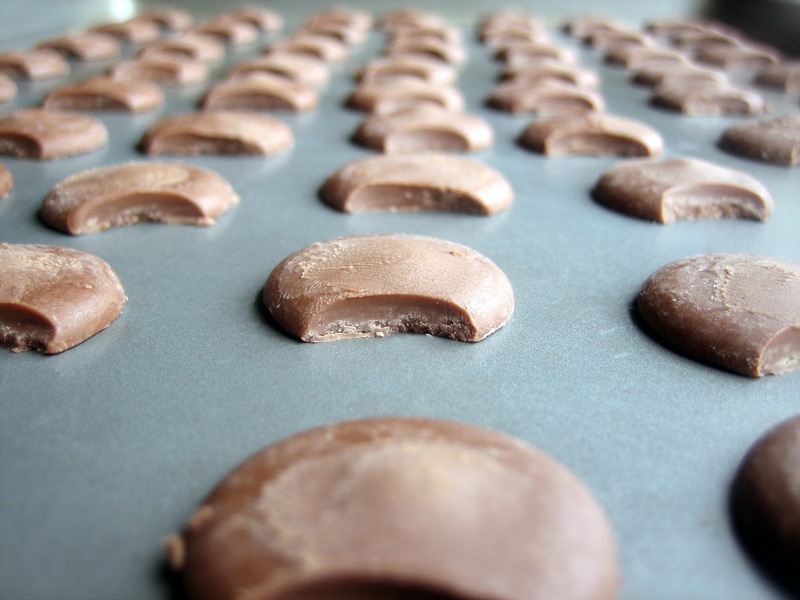 After that, the same cinammon candy is only made in circular form. I then spent the next two days scouring every specialty candy store within a 50 mile radius but there was nary a candy heart to be found. Friday night and countdown to cake pops was underway. 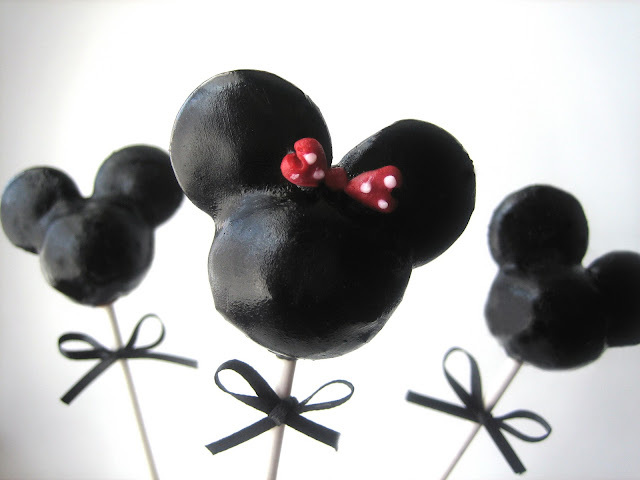 I was sitting dejectedly at my computer trying to convince myself that my little one-year-old friend would understand if I only made Mickey Mouse pops. But really, what's Mickey without Minnie right? So I started contemplating ways to make those darn red bows. 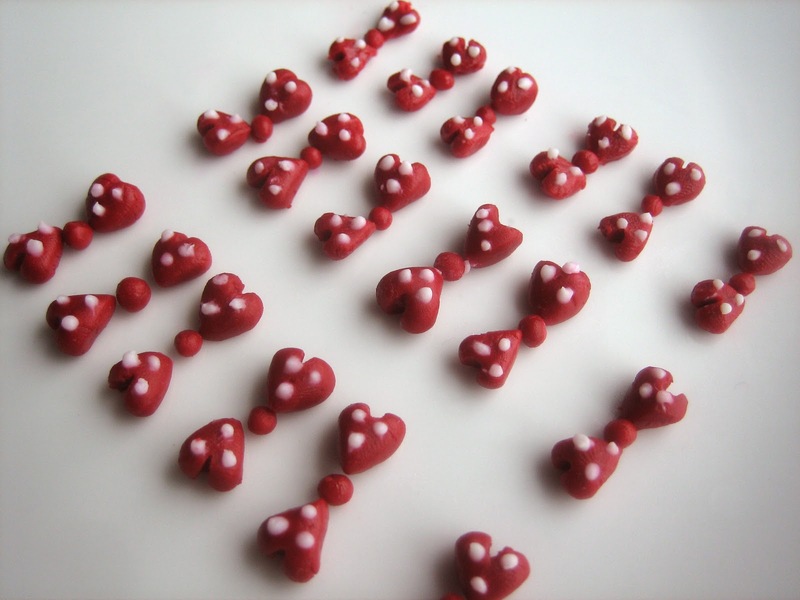 I tried carving red licorice, using halved M&Ms (and for the record, it's hard halving M&Ms), and painting bows with icing. None of the options resulted in the adorable bows I was going for (but I enjoyed eating the failures). So there I was at 10:00 p.m. after a long week of work and I thought, what if I molded the bows out of sugar paste? Two problems. One, I'd never molded anything out of sugar paste. Two, I was not really sure what sugar paste was. 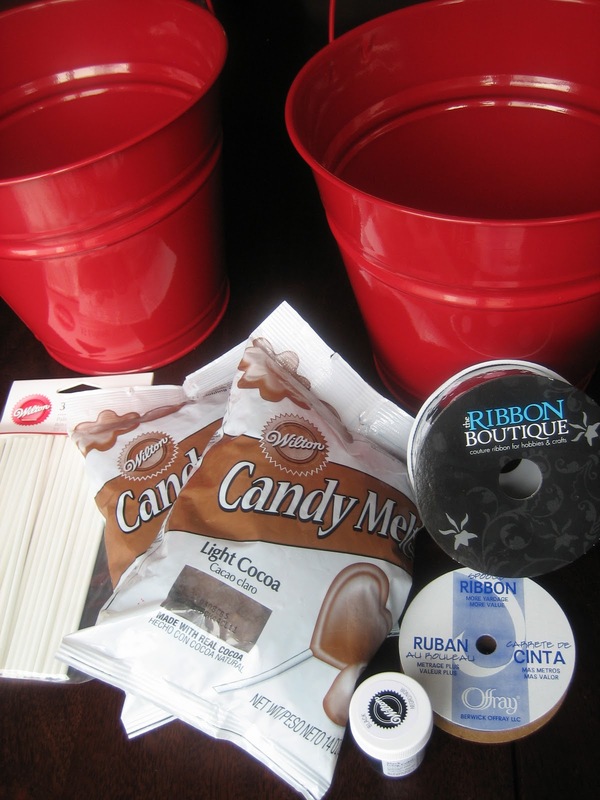 A quick internet search later, I marched into my kitchen and begin concocting me some sugar paste. Think play dough but sweet. Forty-five minutes, one bottle of food coloring, and two psychotically pink hands later, I was staring at my sugar paste. By now, it was close to midnight so I did what any sane girl would do. I start molding me some hair bows fit for Minnie Mouse. Saturday morning, I relaxedly had my cup (ok, two cups) of coffee and read the newspaper. I was a woman content with the knowledge that I had done all of the prep work for my cake pops. I was certain the pops would be made well before I needed to leave for the party. Heck, I even thought I'd have enough time to straighten my hair to impress the one-years-olds at the party. That is, before I discovered that icing color is different from candy color. Three drops of black icing color in my melted chocolate, the entire concoction seized and I was staring at a giant black mess eerily resembling a tarantula. A laughing tarantula. I frantically read through Bakerella's instructions. Yup, in her wisdom, she clearly noted that you must use candy color because it doesn't contain water. I grabbed the bottle of icing color. First ingredient, water. Blast! 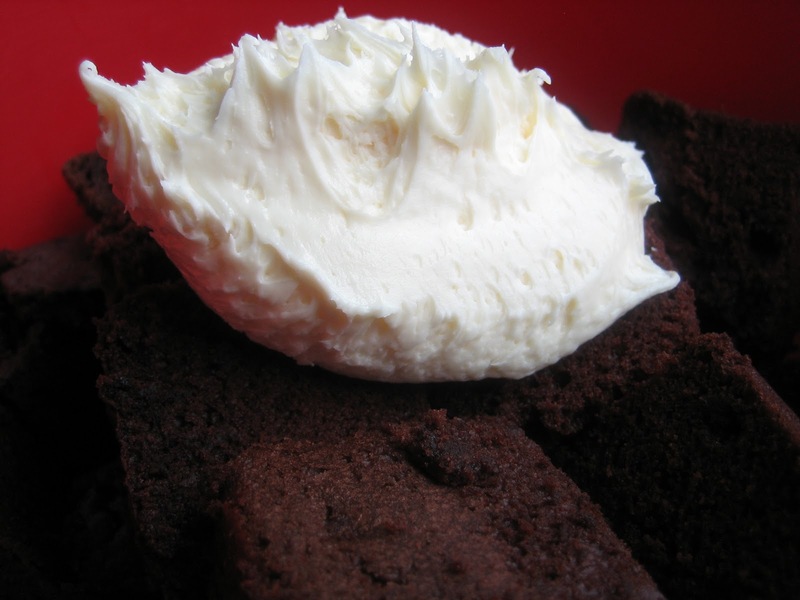 I frantically tried to fix my icing (all the while muttering, "Frick, frick, frick" a la Elliot). This took (a lot) longer than anticipated. I then tied the bows trying not to touch the pops (for the record, I now hate ribbon). Oh, and then, I had to figure out some way to refrigerate the pops in a refrigerator crowded with 43 bottles of condiments and sauces, 6 loaves of bread ranging from sourdough to the hubster's boring 100% whole wheat, and one lonely, six-month-old fruitcake, courtesy of our ever so generous neighbor. Needless to say, I didn't have time to straighten my hair before the parties. The one-year-olds missed out. But I did manage to run in, Mickey and Minnie mouse pops in hand, and a big smile on my face. And I'm glad I did because the party was lovely. Friends and family came out in droves to celebrate with the little man while he contentedly ate his way through his own chocolate cake (more of it ended up in his hair and on his clothes than in his mouth). I wished I was young enough to scramble for candy from the pinata (and yes, the hubster physically restrained me or you know I would have been in that pinata line). And I saw the other side of my good friend, the ever composed attorney. The mama bear side that wiped snotty noses, rescued vases seconds before kids knocked them over, and proudly watched over her brood. It was a good Saturday, indeed. Wow! those look so good. Don't you hate it when you have a specific idea in your head and no matter what the obstacles, you will do anthing to achieve it? I totally get this post and have been on mad witch-hunts for ingredients and little something-specials. It's infuriating but also totally worth it in the end! Your cake pops look great! If I knew you were going to try to make them a couple hours before the party I would've tried to warn you and suggest at least a day or two before. Those cakepops we made took us 4 1/2 hours and we weren't even finished. Plus we had 3 people working. Kudos to you for getting the job done girl! They look adorable! I gotta say, you sure must love that one year old to go through all this for him, lucky guy. Bravo on another thoroughly entertaining story! I am stunned and in awe that you made all those adorable and perfect bows and it was your first time ever using sugar paste (don't think for a moment that I've ever attempted it 'cuz i haven't). These looks awesome. Congratulations, you pulled it through. Great job! I am so impressed! And I'm feeling you with the baby pressure. I sometimes want to tell my parents and in-laws, "If you want another baby that badly, have one yourself!". You are clearly talented in many ways, and I know my niece and nephew would be ecstatic if I handed them a handful of these! These are AWESOME. WHEN and IF you're ready to have babies, you're going to be a great mom! In the meantime, your friends are super lucky! That was so incredibly funny and i completely agree about the baby bit..have been getting it from everyone fr the past few yrs now! Fantastic job! Completely understand the baby pressure and the need to be in line for a hit at the pinata (and how the Missoion: Impossible song pushes you out of the loop for obscure things)... I have my birthday coming up and my hubby said "if you really want one then get one".. I settled for a tiki sippy cup for my frosty beverages since I don't want to be called a copycat in lieu of the last two parties we've been too :) Can't wait to read more of your adventures! These are so totally awesome! I love the little hair bows on the Minnies... they're utterly charming. WOW!! I am so very impressed...they came out great. Okay, so: 1) you are A.MAY.ZING. ; 2) how frickin' cute are these? !, and 3) I have so completely been there - frickety frackin' thing (whatever it may be at the moment) won't just simply behave and it gets PERSONAL. oh, and 4) ps, Bakerella is my secret girlfriend... LOVE! At least that whole palaver paid off! Oh no! Major inferiority attack coming on! Does everyone else know how to make cake pops....but me??? They look amazing! I wouldn't even try - they require more patience and digital dexterity than I will ever have in this or any other life time. Btw - don't think you'd be off the hook after you pop a baby out. Noooooooooo! Case in point; I have 3 boys, I am past 40, AND my mum and mum-in-law are both still holding their breath for a grandDAUGHTER! Parents. You just GOT to love them! Cake pops!!! they are SO cute! I really like them. The black color really makes them "pop". your mom sounds like my mom hahaha. we haven't had any kids (yet) and she keeps asking me every single time when we talked seriously! These are totally amazing! 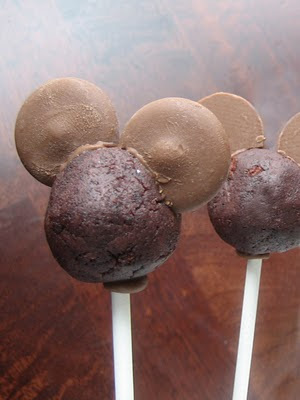 I want some Mickey Mouse pops for my birthday too puleeze! :P Your post made me laugh because it reminded me of my mom and mom in law who believe the sole purpose of R and I existing is to give them grand children!!! Sigh..
those pops are beautiful!! I hope you took some over to your mom! sigh......mothers are all the same, tell her to be thankful your not octomom! LOL! That is hysterical. These are very cute and should be after all of that! I made a Mickey Mouse birthday cake for my son at age 4 (who will be 21 in Aug). I made it in 3 bowls and did all the face painting and black icing stuff. It was cute, but we refused to eat a black cake! We were telling him we were going to Disney World so it was worthwhile. Your story brought back that birthday memory from many years ago! You have me laughing with your story about children :) But for my husband and I all of our siblings have children so at least our parents are a distracted a bit with those grandchildren. You really outdid yourself. I hope the kid remembers all the fuss. OMG! You had me at advanced degrees and no overdue library books! Hilarious. Lovely post! Awesome candy pops! Your ingenuity and determination paid off--these pops are beautiful! Great job! Oh I melted in the face of all the goodness in this post. And I salute your dedication and your success in not only making sugarpaste from scratch, then moulding those darling perfect bows from it! So adorable. I wish I had the patience and steady hands to do this. Looks so great! Wow, those look absolutely awesome. I don't have kids either. My in-laws are Pakistani and in their culture they do the same harassment about kids. Eventually they stopped. Mr P and I have been married 11 years. If we were going to have kids, we would have had them already. When I make treats i feed them to the biggest baby I know: ME. For the Apple Blueberry Crumble, you could use normal sugar too. OHHHHHHHHHH MY GOODNESS. I HEAR ABOUT THESE ON LEQUAN'S BLOG AND NEARLY CRY IN ECSTASY EVERY TIME. I don't know what it is about cake pops that just makes me want to pop. Ha...ha. No seriously yours look amazing, and though I have yet to try them, I'm really looking forward to doing so. I'm still a bit intimidated, I must admit, at the seemingly complicated process. One day, one day...! P.S. I DIDN'T KNOW YOU LIVED IN TORONTO BEFORE! Now that took some dedication! Those look incredible! Btw, I left you a blog award on my site, come and check it out! You did a great job! I'm a huge fan of Bakerella and her cake pop creations. You did a splendid job with the sugarpaste, especially since it was your first time! And you did a great job of fixing your seized chocolate. Love your writing style. Look forward to seeing your future creations! 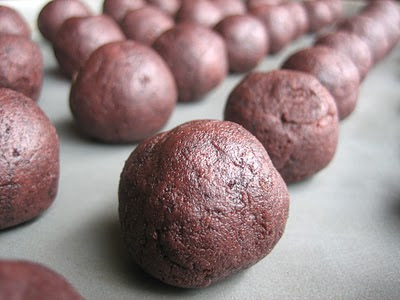 I have yet to make Bakerella's cake pops. I don't think mine will turn out this beautifully. I love the silhouette version very much and the bows are just darling. I love how blunt Indian/Pakistani parents are...no kids = total failure, right? You crack me up! These are adorable, especially the little hair bows! I have never seen such perfection in a dessert. Seriously. Is there anything you can't do?? Please, make me feel better by sharing something!! Secondly, same shoes we are in here.. after 5 years of trying, we still do not have kids(yet) and I have been spending my time cooking,baking,eating,just about anything to do with food! My mom keeps reminding me that she wants to be a young grandmother so I totally empathize with your parental woes. I don't have any nieces, nephews, or friends with babies. But I do know some guys with the mentality of a five year old...so I can make these for them right? They came out splendidly even after all of your trials and tribulations! Oh dear friend . . . you brought me to tears :) Eres un AMOR amiga mia! And YES - despite my current employment predicament it still took me THIS long . . . what can I say?!? And of course, WHAT A HIT!!!! The pops are great! I don't have the patience. awww the Pops are sooo sweet, adorable! I hear you on your 1st paragraph, although my own parents understand why we don't have kids yet. :) The plight of desi children I guess. hehe. Those are adorable. My husband and I don't have kids yet either and his side (his two younger siblings have a total of five kids already) thinks we're losers for not procreating too. I just rub it in their face that I can sleep in. And my life still has a bit of spontaneity. You can actually think that you are so creative for making those little Minnie bakerell. You will sure have your baby soon. Very Very Cute ..Love yours TOO! and haha! I get you with the children thing. I'm only 19 and UNMARRIED and my mom is always saying how she has horrible children and she wants grandkids (in her defense my sis is 25). LOL I'm like MOM. I'm 19. Her response? "In my day girls were married and had 2 kids by that age"
"Mom you had your first kid when you were 25." "WHY DO YOU HATE ME?!"